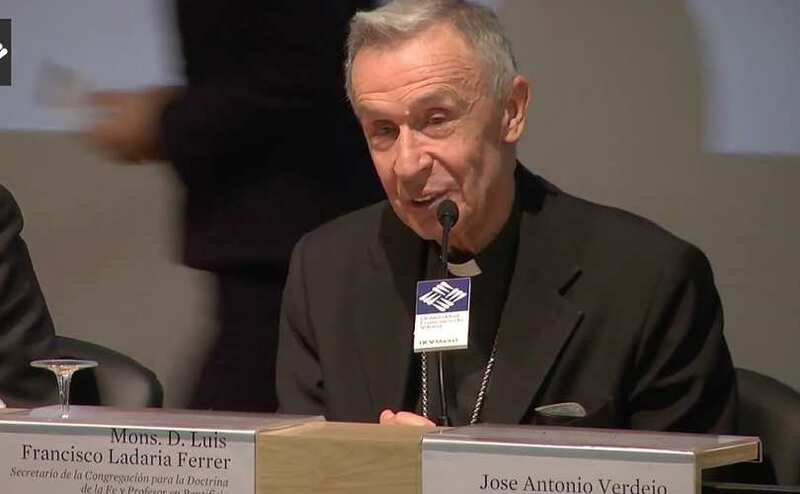 Prefect of the Congregation for the Doctrine of the Faith, Archbishop Luis F. Ladaria Ferrer, has sent a letter in the name of the CDF, under the title Placuit Deo, to the Bishops of the Catholic Church On Certain Aspects of Christian Salvation. Any number of other writers have commented reasonably well upon the text. For that reason, I will focus on but one singular point that I’ve not seen developed elsewhere; one that may well be considered a key to its reading. The first thing that jumps out at the faithful Catholic is the topic, Christian Salvation; as if there is any other kind. The first occurrence of this phrase that I was able to find on the Vatican website dates back to 1976 (under the pontificate of the soon to be awarded Paul VI) in a text produced by the International Theological Commission. This, I suppose, is what passes for “the greater tradition of the faith” mentioned in the first paragraph of the text. Needless to say, this manner of speaking is par for the post-conciliar course as Modernist Rome has long since embraced the lie that all religions offer a path to salvation. That said, I strongly suspect that the primary motivation for so carefully qualifying this treatment of salvation is much more specific; it was done first and foremost in deference to, and perhaps even with input from, the Jews. Though the text of the Letter was made public just last week, it was adopted in the Plenary Session of the CDF held on 24 January 2018. This came just one month after various Dicastery heads had entered into consultation with their “elder brothers” at the Vatican in order to discuss their plans for the future. In other words, it includes a who’s who list of evil doers as the IJCIC represents the interests of those who wish to construct a City of Man, not just independent of the Sovereignty of Jesus Christ as if ignorant of His authority, but rather in bold opposition to Our Lord and His Kingdom. The fruits of their collective efforts are well known as self-identified Jews among this group are at the very forefront of such movements as radical environmentalism, abortion and other efforts aimed at population control, so-called gender nonconformity, and homosexual activism, just to name the most obvious. At this, let’s take a look at how the Vatican’s “closer cooperation” with the Jewish enemies of Christ the King has already borne fruit in Placuit Deo, a text they no doubt find most acceptable. First, let us acknowledge that this letter is a masterpiece of subtlety; offering tidbits of truth alongside equivocations and deflections that serve to water it down to the point of drowning the ignorant. This, of course, is the hallmark of all diabolical endeavors. Some, I suspect, will accuse me of reading too much into the text, but I for one have little doubt that the words I am about to highlight were chosen very deliberately and in large measure for the reasons given. Both neo-Pelagian individualism and the neo-Gnostic disregard of the body deface the confession of faith in Christ, the one, universal Savior. Hey, not bad, eh? After all, it does say that Christ is the one, universal Savior! In other words, if one doesn’t happen to confess faith in Christ, no harm no foul. Placuit Deo reads like an internal memo that aims only to speak about what we believe as Christians. Fair enough, I suppose, but the problem lies in the fact that it was, by all appearances, deliberately written in such a way as to reassure rather than convert those who do not confess faith in Christ; in particular, the Jews. How would Christ be able to mediate the Covenant of the entire human family, if human persons were isolated individuals, who fulfill themselves by their own efforts, as proposed by neo-Pelagianism? Is it merely coincidence that the text poses a question here as opposed to plainly stating what St. Paul wrote in his Epistle to the Hebrews concerning the mediation of Christ? You see, St. Paul makes it known that the mediation of Christ is such that the salvation of the Jews lies in Him; the former testament being of no avail whatsoever with regard to the attainment of eternal life; a truth that the authors of Placuit Deo dare not proclaim in plain language. Here we have a letter addressed to the bishops of the Catholic Church that aims to speak very specifically of Christian salvation; that is why it does not plainly state that salvation consists in mankind’s union with Christ, but rather of “our” – meaning, the Christian’s – union with Christ. As for the Jews, as you will see, they’ve always been good-to-go. At no moment in history did God stop offering his salvation to the sons and daughters of Adam (cf. Gen 3:15), establishing his covenant with all of humanity in Noah (cf. Gen 9:9) and, later, with Abraham and his descendants (cf. Gen 15:18). NB: The gratuitous gift of salvation is offered in Jesus Christ and in Him alone. And yet the CDF Letter is at pains to suggest that the Old Covenant was, and remains, salvific for the Jews in and of itself. By choosing a people to whom He offered the means to fight against sin and to draw close to him, God prepared the coming of “a powerful Savior, in the house of David, his servant” (Lk 1:69). The text is referring to the “chosen people;” those who dwelt, and presume to declare that they presently dwell, in the Old Covenant. So, one wonders, exactly how did God offer them “the means to fight against sin”? If the text means to suggest that the Jews have been endowed by God with the means to defeat sin, the wages of which is death, the answer is that He did not. That victory exists only in Christ Jesus whom the Jews have rejected, but far be it for the Congregation for the Doctrine of the Faith to say as much in a Letter that proposes to speak of salvation. It was clearly written in deference to Our Lord’s enemies and should be consigned to the incinerator along with so many other conciliar and post-conciliar texts. Let us pray for those who collaborated to produce it, whether they identify as Catholic or Jew, that they may be given, and accept, the grace of conversion and the offer of salvation, before it’s too late. The Holy Gospel narrates that when Jesus was crucified ‘there was darkness over the whole earth’ (St. Matt. 27:45)….so is till today, especially since the ‘Modernists’ in the Holy Church of Jesus Christ, in ‘the fear of the Jews’ (Gospel of St. John), without any fear of God, have undermined, compromised the faith in God, that is, faith in Jesus Christ, and the true mission of the Church, namely, saving souls! May God bless all Soldiers of Jesus Christ! Seems to me that the current leadership in the Church fears not to offend Christ and His , One, Holy , Catholic and Apostolic Church but are greatly afraid to offend in the least the worst enemies of the Church; The Jews. I don’t have an anti-Semitic bone in my body but the Jews are bent on destroying the Church. They killed Christ and since they can’t kill him again they will try and kill His Church. Sadly, the leaders in the Church are cheering them on. Jews reject Christ as God. How do you not have an anti-semitic bone in your body as a Catholic? My entire being is anti semitic. I dont despise individual Jews, I despise Judaism. You are letting modernism seep into your being my friend. They are good at it, and getting better and better. They know too well how to parse words and confuse the simple, which comprise most Catholics today. It gives me no pleasure to say that, but I believe it true, most Catholics today just trust, smile and trust. There is just so much information to absorb from these apostates that it is pretty much impossible to keep up with it. That is by design, out of the Marxist playbook, keep em overwhelmed and attack on all fronts. I remember wondering and never understanding why anyone would be against the Jews. We all know the scripture, but still, one can’t hold contemporary people responsible for history, however abhorrent the act. But it has become more clear as time has gone by. There are many who hate Christianity, specifically Catholicism, and work against it day and night. Political correctness will hamstring most efforts at waking up the masses. The second is less surprising, now. Our church leaders are busy selling out the faith and harming it in whatever way they can. It doesn’t matter if they intend this or not, they are doing it. In aggressively pursuing the One World Church Order they so desire, they are mocking St. Paul by trying to be all things to all people by shape-shifting and using capitulation to bring in Protties, Islam, Jews, and all comers. What have they to do with Truth? Nothing. +++ written by a Soldier of Our Lord and Saviour Jesus Christ. Will the ‘elect of Jesus Christ’ awaken, or continue in their lethargy?…..
Come out!……Go!……and Fight! So speaks the very Mother of our Saviour (the Messiah), first daughter of Israel, Queen of heaven and earth. 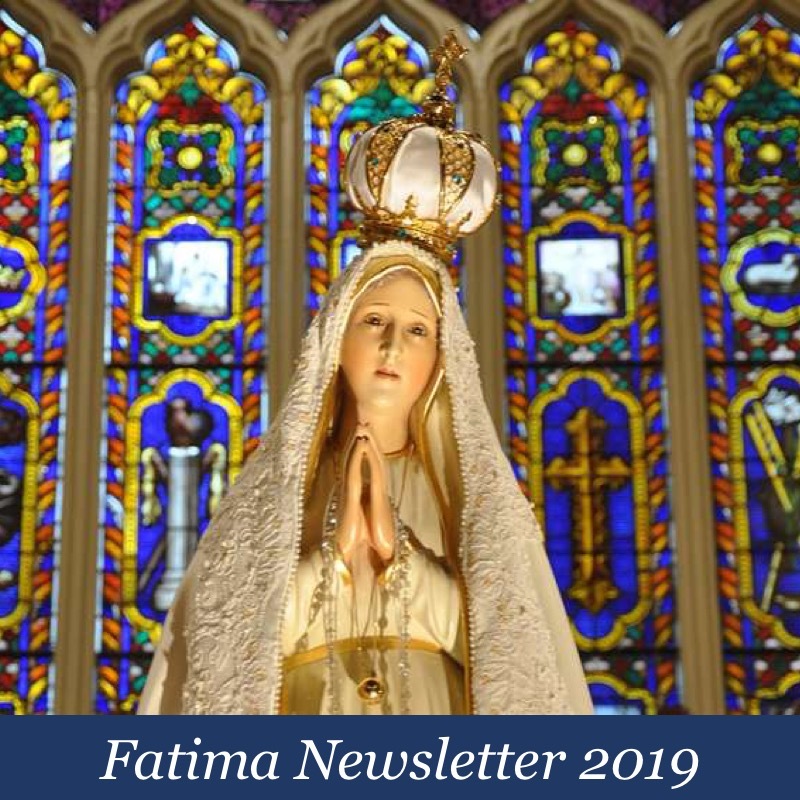 Our Mother and our Queen – our life, our sweetness and our hope! Apparently the Vatican has approved a French monastery, along with a couple dozen Society of St. Peter parishes, permission to celebrate Holy Week with the 1953 Liturgical Missal. However they MUST use the Benedict XVI prayer for the Jews. Oh well- Those perfidious Jews may continue in their blindness, undelivered from their darkness. While the author of this treads rather delicately to avoid outright anti-Semitism, several of the commenters just go whole hog into it. You can publish what you want, but this topic is probably best left alone, as it appears to take very little prompting for all too many Trads to erupt into Jew-bashing tirades. You don’t give an 8-year-old a bottle of toxic chemicals and say “oh, he can read and the warnings are clearly there on the label.” So unless you are deliberately baiting these people, stop writing about this topic. A baptized Catholic serial child molester’s mother puts the Brown Scapular on him as his health begins to fail and he repents and gets himself a plenary indulgence and Last Rites. God sends him straight to heaven when he dies. Seriously? This from a God who is Himself perfectly just? You actually believe this? “Anti-semitism” is a made up modernist phrase. As Catholics we are called to speak out against those who deny our Lord. We arent called to speak out against them to belittle them, we are called to speak out against them in true charity because they are spiritually lost, just as we are called to admonish the sinner. In THAT regard Im an anti semite, just as Im an anti muslim, an anti protestant, and an anti atheist. I’m not sure that a car thief saying that he also sells drugs and burgles houses makes the first one OK. 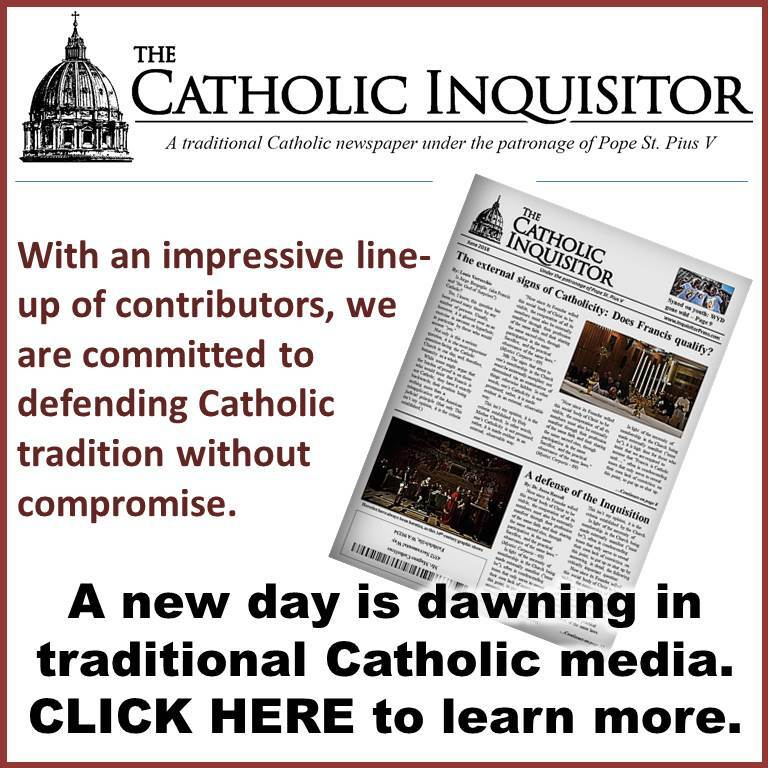 Most people of other faiths don’t actively “deny our Lord” or work against the Catholic Church – they were just raised in their tradition and have no interest in changing. They may not do it “actively” as you correctly point out, but they still do so passively and unwittingly. We can never judge the non-catholic subjectively. But objectively, if they profess a faith different than the faith handed down to us, then they are anathema and we must denounce their error while praying and working for their conversion. Our task has been made extremely difficult with V2 and the NO since we cannot associate what most believe to be the Catholic Church with the Catholic faith. It is diabolic disorientation. Who are you to judge God? Jesus told us salvation came through Baptism. If God grants mercy at death to righteous pagans and Jews, that’s His business but the dying must at least put their hand out towards that mercy. God doesn’t force Himself on anyone. As for anti-semitism, I would be careful. The definition of semitic as applied to Ashkenazic Jews is a modern construct. It is very likely the origins of these Jews is from the Causcus region of Russia. They are considered Asiatics. They haven’t a drop of semitic blood. Their claim of semitic blood is done for political effect. That being said, I also assert that unwarranted prejudice and bias against Jews or anyone is unChristian. After all, we should all be judged on our own merits, as we are all made in the image and likeness of God with Jesus salvation open to all those who accept His Truth. I have reason to believe that many of my ancestors were German Jews who converted to the Catholic faith or married Catholics. I pray for the repose of their souls and hope they accepted Jeus’ invitation on their death beds. To point out that there are those who are enemies of Jesus Christ and hate His Church, and who are prepared to do everything in their power to attempt to destroy Her, is not ‘anti-Semitic’, it is pro-Catholic. Blunderbuss, “as you live so you die” – it would be very difficult for a person who didn’t love the Lord and didn’t follow his commands – and who did in fact the exact opposite – to have Perfect Contrition in the hour of death. As for the brown scapular, one would need to have been enrolled, worn the scapular in life and have strived to live according to the precepts of the Brown Scapular with a great devotion to Our Lady. Being terminally ill makes you rethink things. So let’s say that happened to the child molester in this example and he sincerely repents, Jewish guy is moral but doesn’t convert. What happens to them? It would be very difficult to achieve with a heart heartened by a lifetime habit of mortal sin and the associated sins of lying to himself and others etc. But if he does respond to the grace to him given by God in his final illness and converts to the Catholic Faith and has true love of Christ and perfect contrition, he might be saved, perhaps having to spend a long time in purgatory, according to God’s perfect justice. As you know, one of the thieves on the Cross next to Christ believed and acknowledged his sins and heard the words “Today you will be with me in Paradise”. Yet again the diabolical Blunderbuss assaults us with his diabolical concern-trolling, this time by yet again siding with the Christ-killing tribe. Crawl back into your hell pit, demon Blunderbuss. Dear AlphonsusJr. During the Holy Season of Lent, may I suggest that all who visit Louie’s blog exhibit more kindness and understanding to those who do not conform to our own way of thinking(….. and the greatest of these is CHARITY.) May Our Lord’s peace fill all our hearts. Demon Blunderbuss (note the similarity to Beelzebub), overflowing with false compassion, has nothing but soft, fragrant words to say about both the Christ-killing tribe (Jews) and those who commit one of the four sins crying to heaven for vengeance (stinking sodomite perverts). This demon can’t be opposed vigorously enough. I now return to my Lenten silence. Methinks Blunderbuss is an agent provacateur. This is the 3rd time (maybe 4th) that you are returning to your Lenten silence. Good Luck to all of us! Yes, AdolphusJr, I’m Beelzebub. I use my downtime while plotting with Freemasons against the Church to post comments on comboxes. I thought us demons had superior intelligence to humans but you, Adolph, have bested me and found me out. If you’re not just being wacky for effect, you really need to rethink your attitude regarding persecutions and genocides you seem to want to inflict. They’re not Catholic. Excellent. More coverage of this horrific tribe is needed as they continue to wreak havoc against any last vestiges of Christendom. Scroll down on that page to see pic. Thank you, Louie, for speaking about things that in most cases not even ‘traditionalists’ want to touch with a barge-pole. Yet those things need to to be spoken about. In order to truly comprehend the destructive corruption and confusion that exists in the Church today it is necessary to acknowledge that there are those who hate Jesus Christ and His Church, and who will do anything in their power to bring about injury to Her. “We do not speak about the Jews as a ‘race’, but rather about the Jews as religion. So, even the Jews of today, as long as they do not withdraw from this ‘crime+++Deicide’, (for it is ‘they who asked for our Lord’s death and called for His blood upon their heads and the heads of their children’), from this action of their ancestors, they are also guilty of it. They must disassociate themselves from it and recognize our Lord; they must be baptized and become His disciple” (Time Bombs Of The Second Vatican Council). ……..how this fear has spread like a wild fire, especially, amongst those who should defend His Truth in ‘fearless faith!’…..Miserere! IS ST. JOHN AN ANTI-SEMITE??? Benjamin Freedman, convert from Zionism, gives a spellbinding 45 minute speech in 1961 on the Zionization of the United States. Hugh Akins’ “Synagogue Rising” is a superb description of the two camps: Satanic Talmudism (modern “Judaism”) and the Catholic faith anchored by papal teaching. Is it any wonder the tidal wave of contemporary propaganda and therefore confusion, when we consider that Talmudic Jews, 98% of modern Jews, are the spiritual descendants of the Pharisees?!? “… 23 Woe to you scribes and Pharisees, hypocrites; because you tithe mint, and anise, and cumin, and have left the weightier things of the law; judgment, and mercy, and faith. These things you ought to have done, and not to leave those undone. 27 Woe to you scribes and Pharisees, hypocrites; because you are like to whited sepulchres, which outwardly appear to men beautiful, but within are full of dead men’s bones, and of all filthiness. Is St. Matthew an anti-Semite?……… perhaps Catholics ought to upgrade the Scriptures. Prohibiting us to speak to the Gentiles, that they may be saved, to fill up their sins always: for the wrath of God is come upon them to the end. And not as Moses put a veil upon his face, that the children of Israel might not steadfastly look on the face of that which is made void. But their senses were made dull. For, until this present day, the selfsame veil, in the reading of the old testament, remaineth not taken away (because in Christ it is made void). But even until this day, when Moses is read, the veil is upon their heart. For as many as are of the works of the law, are under a curse. For it is written: Cursed is every one, that abideth not in all things, which are written in the book of the law to do them. A sample; to the ‘ignorant’ ‘lukewarm’, ‘trembling in fear’, and ‘indifferent’ …. Today, the Second Vatican Council with the ‘church of nice’, ever so politely with human respect, believe and profess……..The pre-Vatican II Church, with the Apostles, all the pre-V II popes, and saints are ANTI-SEMITE!!! “Race’ hatred, is NOT possible for Christians!, let me make this clear, it is a ‘hatred’ of the evil, that is fostered by the Talmud. Jews hate Him as an imposter…..Miserere! Jews defile her as a harlot….Ave Maria! Jews have spearheaded the entire abortion holocaust. In short, we must not be deceived into dropping our guard over the lethal falsehood that Islam, rather than Judaism, is our deadliest enemy.” (Synagogue Rising by Hugh Akins). Thank you, From Poland, for your testimony on behalf of Christ, especially Hugh Akins book. These central Asian Khazars, Ashkenazis, Pharisees, are not true semites. They were converts to Pharisitic Judiaism. They are as phony as an American three dollar bill. I’m very glad to see someone from Poland blogging in English. I am convinced it will be the V4- Poland, Hungary, Czechland and Slovakia, that will send a posse into the Vatican to clean out the heretics. I discovered many years ago that with regard to the Jews in Poland, Poles had their eyes wide open. I see a lot of quotes from you and others about how certain people – including, sadly, some Popes and other historical figures – hate Jews. You conveniently ignore the examples of Popes and Saints who disagree and even defended them. I also see quotes from highly questionable sources, and several conspiracy theories about how Jews aren’t actually Jews and how you can therefore hate them without being an anti-Semite. If you actually believe that last part, there isn’t a whole lot to say – it’s defining your own reality and logic clearly doesn’t apply. You and others can test your theory by yelling about how you hate Black or Asian or Hispanic people directly to a person of that race and see how they react when you assure them that it’s ok because they’re not really a real Black or Asian or Hispanic person so you’re totally not a racist. But fine, if you want to nitpick about how the term “anti-Semite” doesn’t apply to y’all, we’ll go with “Jew-hater” from now on. 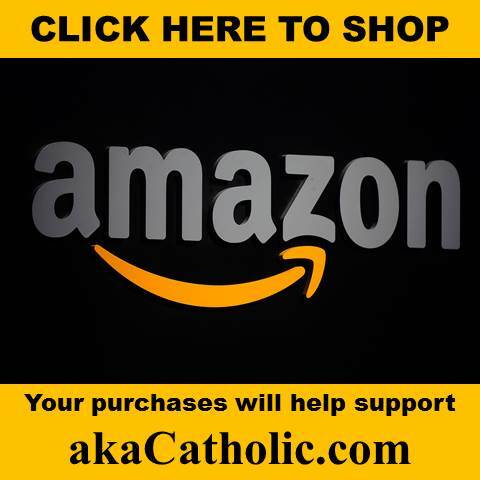 So let me ask you this – where in Jewish writings or in your own personal experience have you ever met a Jew who was out to destroy the Catholic Church? I’m talking mainstream Jewish writers or people, not extremists or nutcases. Because I’m guessing you’ve never met one. My dear Blunderbuss, you have aptly named yourself as a short muzzled gun accurate only at close range or otherwise known as a noisy insensitive blusterer. Your avatar fits. 1) All Judiaism and most especially Talmudic Judiaism reject Christ, reject His mission, reject the Church, deny the Trinity, deny the Incarnation, deny the Resurrection and even by some deny the very existence of Jesus Himself. Instructing the ignorant and admonishing sinners are spiritual works of mercy. When any Protestant, Jew, Moslem, or non-believer confronts me with their erroneous beliefs regarding he doctrines of the Church I believe I have an obligation to charitably correct these diablolical beliefs. The reason is because beliefs have consequences. 2) St. John in the Apocalypse 2:9 said, “I know thy tribulation and thy poverty, but thou art rich: and thou art blasphemed by them that say they are Jews and are not, but are the synogogue of Satan.” Thus, proving that even in the times of the Apostles, Jews were recognized as FAKE Jews, and instead were not followers of Moses nor intended to honor God, but instead sought to bring themselves and us to the feet of Satan. If these Jews are true semites and any assertion to the contrary is a “conspiracy theory”, then how do you account for the fact that Israeli publications have recently published DNA research demonstrating that Askanazic Jews have almost no semitic DNA? (reference available from Henry Makow.com). I will restate, it is likely I have plenty of German Jewish descent, as do other of my relatives. The region I lived in must have attracted converted German Jews. I didn’t and don’t hate myself, because of that. Nor do I hate other nonbelievers in Christ. All people must be judged on their words and actions. If they are evil, treaherous and subversive of society and their belief system is tyrannical and subversive, then they and their beliefs should be fought and denounced. In every single one of these abominations, and others I could and should add especially uncontrolled, unjust wars, they are promoted and funded by Jews and Jewish connected organizations – B’nai Brith, NARAL – etc. These groups and organizations are anti-human as well as anti-Catholic. And yes, I have met these people personally and felt the hot breath of their hate. Have I met someone famous? Probably not, but maybe I’ve forgotten. Repeatedly, the Bible states that when the Gentiles worshipped, and when Israel worshipped as the Gentiles did, they were actually worshipping demons (Lev.17:5-7; Dt.32:12-18; 2Chron.11:13-16; Ps.106:34-38; 1Cor.10:18-22). Any non-worship of God (Atheism), worship of “gods” (paganism, e.g., Hinduism, Buddhism, Shintoism, etc. ), and worship of God that is not through, with, and in Christ (Talmudic Judaism and Islam) is of Anti-Christ. All pagan religion worship of “gods” is worship of demons. But Talmudic Judaism (as different from Torah Judaism or Old Testament/Old Covenant Judaism; New Testament/New Covenant Judaism simply being New Israel/Catholic Church) and Islam by pretending to worship God while at the same time explicitly denying Christ end up implicitly worshiping not just a demon but the Devil himself. Talmudic Judaism is made up of unbelieving Jews (those who reject Christ as Savior) who persecute believing Jews (those who accept Christ as Savior) and are called the Synagogue of Satan by Christ Himself (Rev. 2:9; 3:9). In the same passage, Christ calls unbelieving Jews ‘liars’ for they are not real Jews at all (true believers in God’s revelation as they have rejected Him who is the fullness of revelation). Anti-Judaism, anti-Zionism, and anti-Semitism are not the same thing at all. Anti-Judaism refers to being against the religion of Talmudic Judaism (all Catholics have to be anti-Judaism); anti-Zionism refers to being against the existence of the modern State of Israel (Catholics can be pro or anti-Zionism); anti-Semitism refers to being against the Jewish “race” as an ethnic group (no Catholic can be anti-Semitic since no Catholic can be racist). All pagan religions are by definition enemies of Christ and His Church but Talmudic Judaism and Islam have a special hatred against Christ and His Church (Islam’s claim to honor Jesus are in fact false for they explicitly deny that Christ is the Son of God and as such reveals itself to be the work of Anti-Christ). Talmudic Judaism and Islam are the only two religions that explicitly deny in their unholy religious texts that Christ is He who He says He is in Sacred Scripture and from their beginnings have fought against His Church. Initially, Satan used Talmudic Judaism to physically persecute the Church but when the number of unbelieving Jews became insignificant against those of believing Christians, the Devil created Islam which for the past 1400 years has been unrelenting in physically persecuting the faithful. St Paul says that man is spirit, mind (soul), and body. Satan uses Talmudic Judaism for attacking the spirit and mind of the Christian believer by subverting his faith and morals through Freemasonry, Socialism, Feminism, Cultural Marxism, usury, libertinism, etc., and the Devil uses Islam for attacking the body of the Christian believer by jihad and sharia law. Talmudic Judaism is as sophisticated, seductive, and subtle as Islam is barbaric and brutal but both are deadly for the one who believes in Christ. From my perspective, of all the scandals present in Vatican II and in the post-Conciliar Church, by far the worst has been the Assisi Inter-Religious Prayers. That it was post-Conciliar Popes that called for and presided over these abominations against the First Commandment and against the Great Commission is simply surreal; and JP II and B XVI are as guilty of this idolatry as F I. 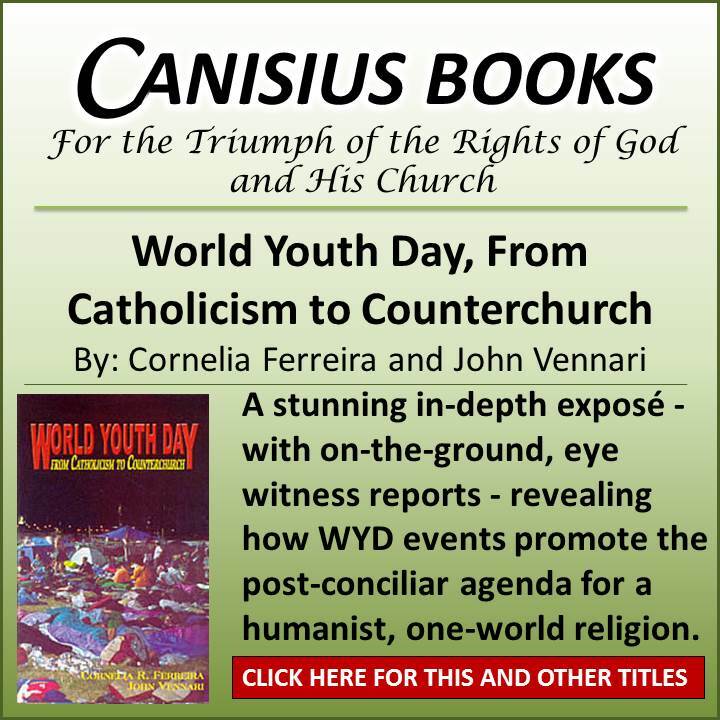 The post-Conciliar Popes in effect have facilitated the worship of demons and the Devil himself; if this is not diabolical disorientation than I don’t know what it is. Can you tell me what Pope or Council defined and condemned racism? Yes, Pius XI, according to Peter Eisner, was the world’s most prominent critic of Hitler and his rhetoric of ethnic “purity”. To make his voice heard, Pius called upon a relatively unknown American Jesuit (from the Eastern Shore of Maryland, who worked with African-Americans), whose writing about racism in America had caught the Pope’s attention. Pius enlisted John LaFarge to write a papal encyclical publicly condemning Hitler, Mussolini and their murderous Nazi campaign against the Jews. The encyclical was deep-sixed by the traitors surrounding Pius XI, including Eugenio Pacelli and the head of the Jesuits, Wlodimir Ledochowski. Today, I would take issue with LaFarge’s view that this racism was anti-semetic, because, as I have stated before, modern Jews have no semitic blood. But, that does not take away from LaFarge’s point, that hating people on the basis of their race is immoral and contrary to Catholic belief. Yes, we must condemn immoral words, actions and beliefs, especially the Talmud and Koran but the sanction of those actions and words and beliefs does not comport with hatred of persons based on their physical appearance, hair color, eye shape, height, level of ability or disability. To believe otherwise is to hold that the Catholic faith is indifferent or approves of discrimination or worse based on appearance.